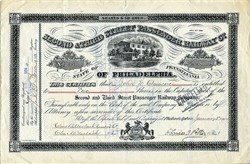 Beautiful certificate from the Second & Third Street Passenger Railway Company of Philadelphia issued in 1904. This historic document was printed by the Geo S. Harris and Sons Lithograph Company and has an ornate border around it with a vignette of a house with a stagecoach passing by. This item has the signatures of the Company�s President, and Treasurer, and is over 105 years old. 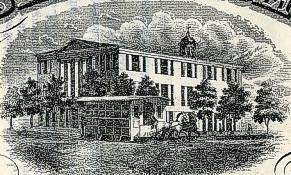 A stage coach drawn by two horses was the beginning of Philadelphia's present transit system. It made hourly trips from "Schuylkill Seventh and Chestnut Streets down to the Merchants' Coffee House in Second Street." That was in December, 1831. James Boxall was the genius who inaugurated its hourly trips. He was proprietor, driver, conductor and ticket agent. The fare was ten cents single, or a dozen tickets for a dollar. Philadelphia, with its suburbs, had at this time about 175,000 inhabitants. James Boxall was the only man among these thousands who possessed brains enough to perceive the possibilities of his scheme. Within two years another bus line was put in operation. It ran the length of the city north and south. Starting down at the Navy Yard, it led out Second Street to Kensington. The fare was a "levy," or twelve and one-half cents. Its time schedule was one trip per hour. Not until twenty-five years later (1858), was the first horse or street car line established in the city. In 1894 this railway was still going strong with 754 horses and over 37 miles of track. From their inception in 1858 to 1894, the company had over 12,000,000 cumulative passengers.